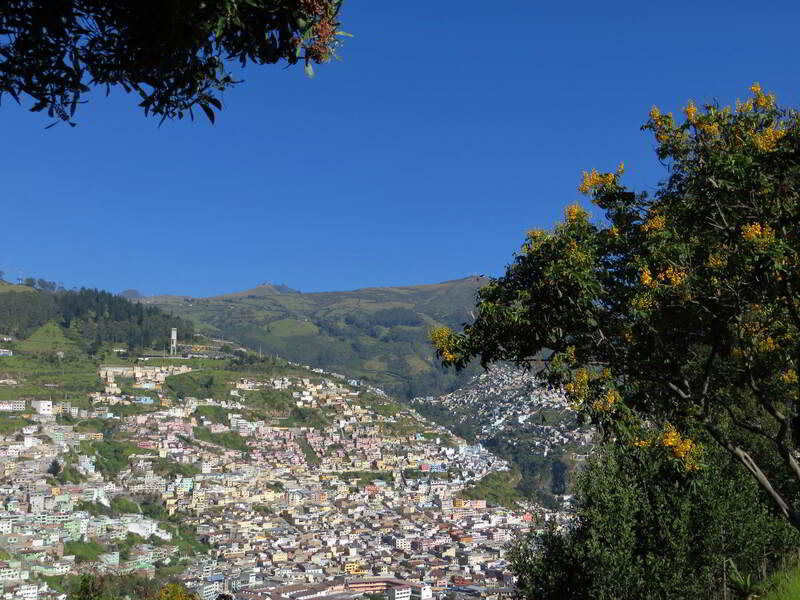 On this page we suggest some common sense do-and-don'ts in Ecuador to travel safely and stay healthy in Ecuador and elsewhere in the tropics. We provide these suggestions because we want you to have a fabulous experience in Ecuador and go home with great memories about some of the greatest vacations you have had in your life. Don't let these suggestions discourage you, because Ecuador is one of the greatest tropical countries in the world to discover and explore! The early bird catches the worm: The best hours of the day are the early morning, whether you are a culture lover or a tree hugger. The morning hours are always the coolest hours of the day, which in the tropics is important. If you want to see birds and wildlife, the best hour of the day is from 5:30 - 6:30 AM. The guides of our Ecuador Amazon rainforest lodge, the Cuyabeno Lodge, are widely known for the knowledge about birds as well as other Amazon Jungle Animals and Amazon Rain forest Plants. For photography in Quito, Ambato and Ingapirca, the best hours are from 8 - 10 AM and then again often from 5 - 6 PM. Unload the pictures from your camera onto your laptop or cyber space whenever you get to your hotel. If you lose your camera, at least you will still have your pictures. Take minimal 3 camera batteries with you. Also charge your batteries on every opportunity you get and Don't forget to take your charger out of the outlet each time you put the battery back in its place. Always check the outlets when you leave your hotel room (and your closets of course). Early morning cloudless sky over Quito. Always rise early, take your breakfast quickly and go see the town before the clouds move in. Sometimes around 5 PM, the clouds move out and the city bathes in the warm colors of the late afternoon. Pickpockets are everywhere in the world and you can become a victim anywhere. However, the colonial part of Quito is packed with tourism police officers in uniform with a bright yellow vest. Anywhere you walk, you see them patrolling the streets in their bright yellow vests and I personally feel totally safe while strolling the streets. 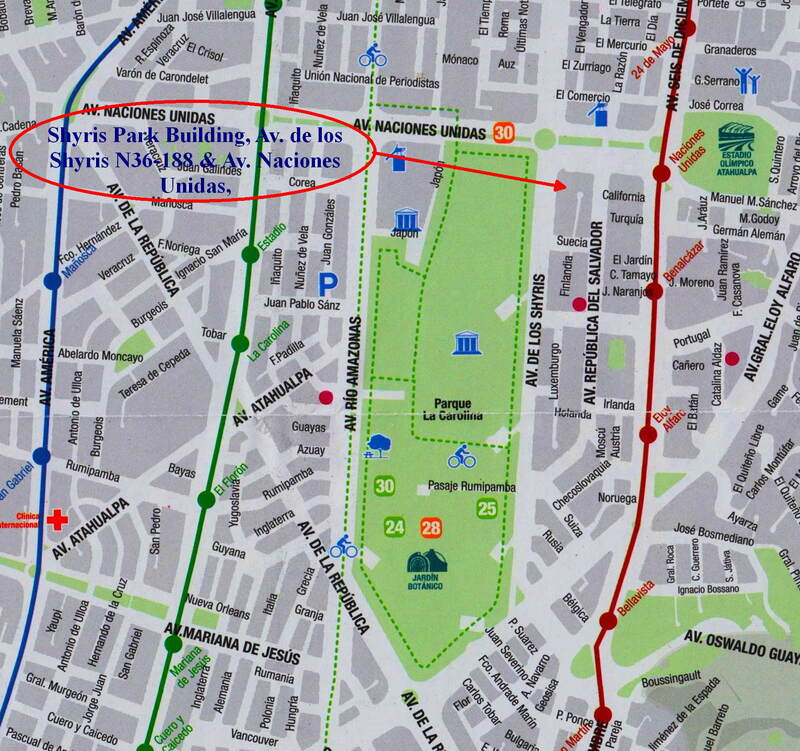 Some other areas in Quito, however, are certainly less safe, and, always be prepared for the unexpected. 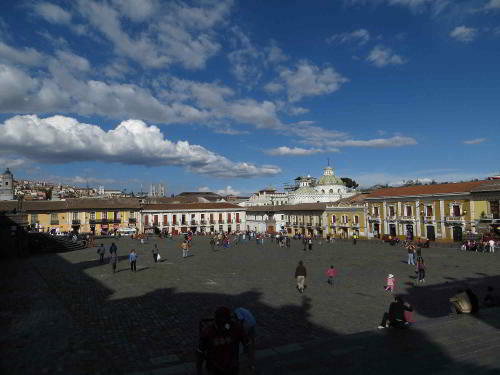 Colonial Cuenca, is much less mundane than Quito, and - for my feeling - enjoys the provincial values of the past. Guayaquil is an international harbor, meaning that in our feelings about safety, all the prejudices would apply, not based on statistics, but on how we experience safety. Ladies, if you can do without jewelry for a few weeks during your vacation, that is probably wise. And gentlemen, that Rolex really gives off the wrong signal to pickpockets! Worn clothes, old suitcases, carry-on bags and backpacks draw less attention than new ones. In general, don't draw attention showing off as the well-to-do tourist from North America or Europe. 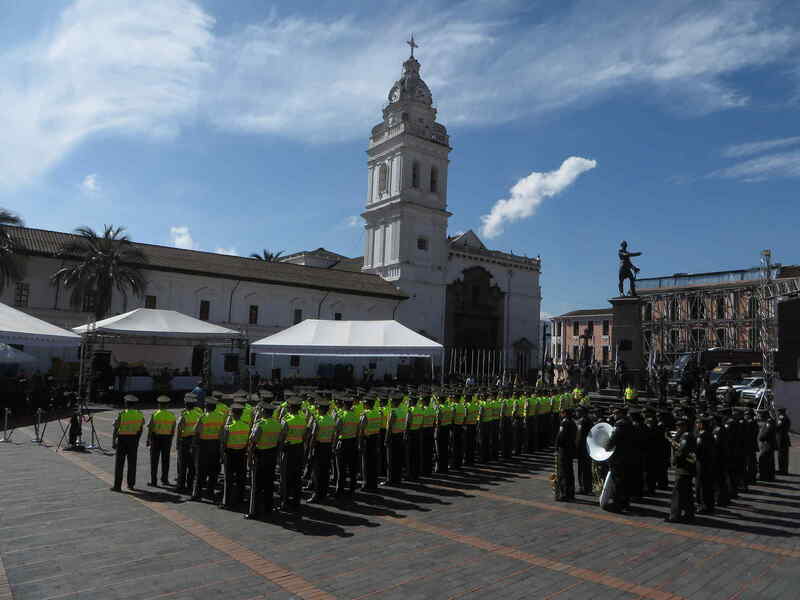 Omni present tourism police officers in Quito recognizable by their bright yellow vest. I guess, - but I don't have figures - that it is much and much safer to travel by bus, than riding a private vehicle, as is the case in most other countries of the world. 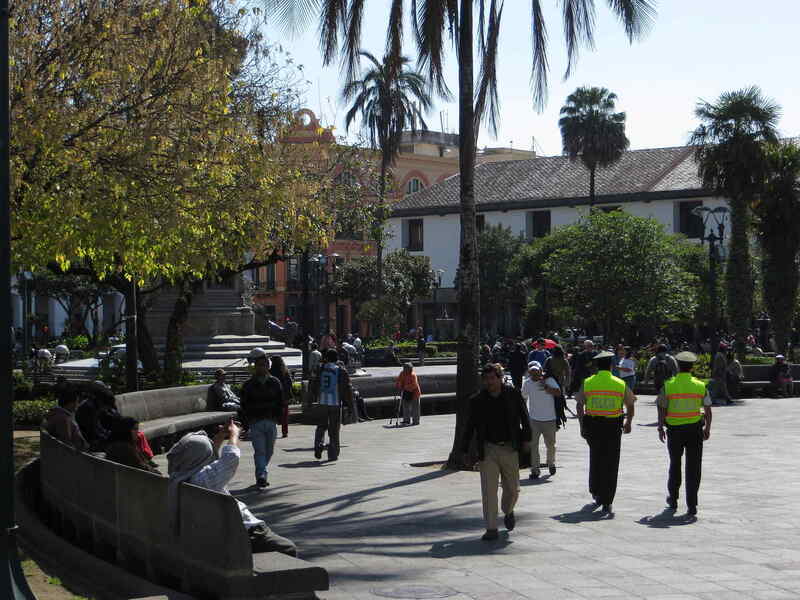 On the other hand, the petty theft risk in busses is considerably higher, particularly in the (trolley) busses (Metrobus) in Quito, which have a reputation for being frequented by pickpockets. So in city busses keep your hand in your pocket on your wallet all the time and avoid taking the bus with valuables, lots of cash and your passport on you. If you must carry valuables, it is probably much wiser to take a taxi. In most towns, including Quito, I stop taxis in the streets. Guayaquil however, is building a reputation for taxi robberies, a phenomenon that is spreading in Latin America. So, whenever possible, in Guayaquil, you may want to order your taxi through your hotel lobby, but of course this is not an option if you are not at your hotel. Always only take registered taxis with a number on the outside and a taximeter. An increasingly popular crime is robbing people after they leave a cash machine, Western Union or a bank. Before you withdraw money, look around if there are suspicious people hanging around (loitering), and if so, chose another location for withdrawing money. If possible, prepare yourself beforehand to be able to cross the street immediately after your withdrawal and watch out if anybody is following you, if so, run and cross the street again. If you make yourself a difficult target, chances are that the thief will chose a different target. Few ATMs accept foreign bank cards. Mine work with the Banco International. 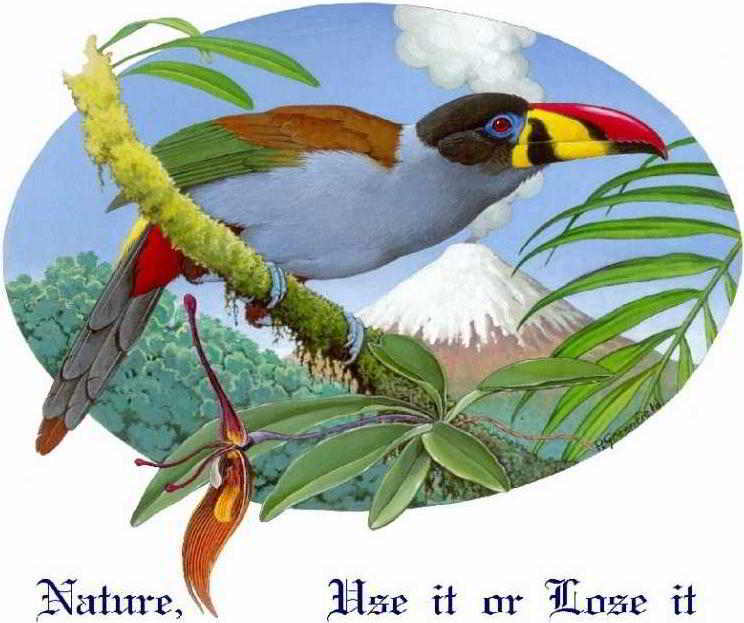 If you decide to travel to Ecuador and/or the Cuyabeno Faunistic Reserve, always be aware of your surroundings, your luggage and valuables, but don't overdo it. Don't let your travel fun be overshadowed by continuous fear. This is YOUR vacation, YOUR great time, don't let a petty thief ruin your fun! ALWAYS ENJOY YOUR VACATION, even if someone succeeds in snatching something away from you! Changes are that whatever someone steals from you is only a fraction of what you spent on your total journey. So don't let some petty thief ruin your vacation experience, and if it happens, - for your own peace of mind - consider is as a part of the overall travel costs, even though at the moment it hurts. 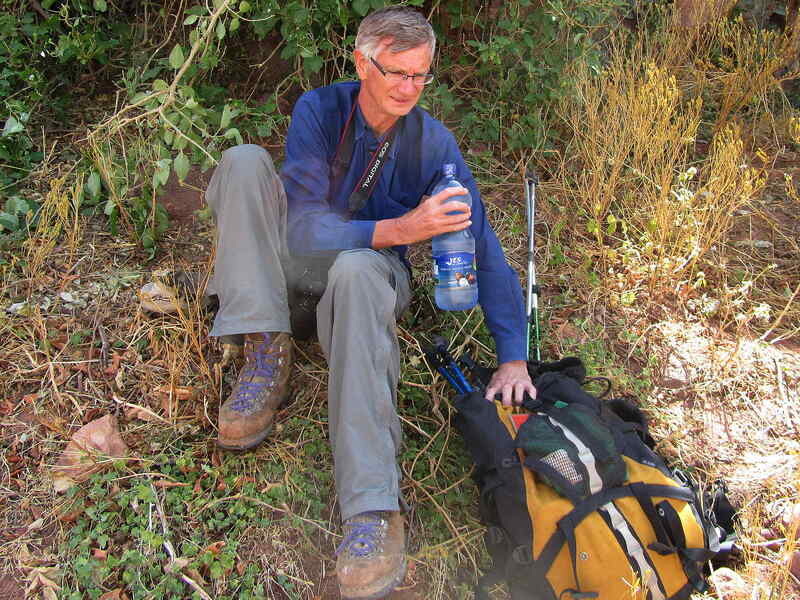 You may come across friendly travelers and local guides who will tell you what is safe to eat and drink. Never be fooled by the such advise from others. Having travelers diarrhea and a fever is no fun, so don't take risks. It is not a question of how harmful or harmless the local microflora and microfauna is, but how YOUR BODY reacts to it. So if you are new to a country, always drink bottled water (never from the tap) and hot drinks. Fruit juices in Ecuador are delicious but you don't know if they have been made with bottled water (in the lodge our juices are prepared with bottled water). Raw vegetables are always a bit risky and you have to ask yourself how sensitive your stomach is. 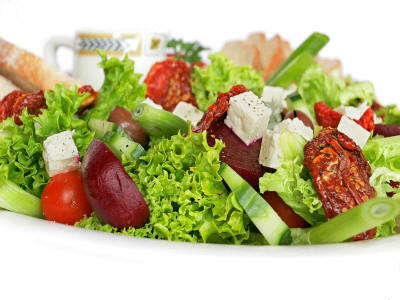 Avoid eating raw salads if you are new to the country. Most restaurants will simply wash the lattice in water, which will not kill the local bacterial flora which may cause travellers diarrhoea. Order dishes with cooked vegetables. Always use sunscreen with SPF factor of 30 or higher (don't forget the edges of your ears and your feet). Gradually accustom your skin to the sunlight by exposing it for no more than an hour the first day and add an hour everyday afterwards. Don't be fooled by an overcast sky, you can still get sun burn when it is cloudy. Be particularly aware in the high mountains and on the water, where the UV effect is much greater. Also beware of wind, as it also tends to increase the sun burning of your skin. It is amazing this still needs to be said, but every year foreigners end up in prison for the possession of drugs. If caught with drugs, you may be in for a long time already in for-arrest. I don't understand why this needs to be said, but stay far away from drugs. Each year, dozens of foreigners are arrested by Ecuadorian authorities for attempting to traffic drugs between Ecuador and North America and Europe, or between mainland Ecuador and the Galápagos Islands. Many of those arrested claim not to have known they were transporting drugs. Under no circumstances should you ever accept gifts, packages, or suitcases from anyone you do not trust and know well. More ideas and tips on do's and don'ts in Ecuador will come over time and suggestions are always welcome. Enjoy the beautiful country of Ecuador and discover the Amazon Rainforest of Ecuador and you may like to look at these great things to do in Peru. When the USA started banning smoking in public places it was quite a surprise to me to immediately see that Latin Americans voluntarily followed suit even before imposing legislation on banning smoking in public places. In regard to smoking, American tourists behaved as they do at home: they leave the building and smoke outside. Pretty soon, the only smokers inside buildings were invariably Europeans and occasionally Asians! Latin Americans won't comment easily on smoking inside, but they certainly don't appreciate it. So, I urge smokers to respect the common practice as well as the Ecuadorian law and enjoy your moment of pleasure where your smoke can't discomfort others, which usually is outside buildings.